In 2017, practically everyone has a cell phone. They make it easier for us to stay connected via phone calls, text messages and social media. They become problematic when we try to use them while driving a vehicle at 55 miles per hour. The National Highway Traffic Safety Administration (NHTSA) has held multiple campaigns to illustrate the dangers of texting while driving. AT&T has a campaign dedicated to eliminating texting while driving. #itcanwait. There’s even an app for that! Drive Mode is an AT&T app that turns on once the phone is moving over 15 mph. It silences incoming calls and alerts and automatically replies to text messages that you are driving. Despite all the warning about cell phone use while driving, accidents due to texting continue to increase. Answering a text distracts your attention from the road for about five seconds. Moving at 55 mph, that’s enough time to travel the length of a football field. Automotive manufacturers recognize the problems associated with texting and driving. They are developing precautions and safety features to help eliminate accidents. Some vehicles synchronize with mobile phones and allow the text messages to be shown on the radio dashboard or screen of the car. Some vehicles enable voice technologies, the message is read to the driver through the audio system and allows the driver to respond verbally to the message. New drivers with a learner’s or intermediate classification on their licenses are prohibited from using their mobile phones while driving in Louisiana. Drivers who violate the texting law are subject to a fine of $175. Additionally, there is a statewide ban on using a cell phone or tablet to write, send or read text messages while driving, regardless of age or license classification. While driving in a school zone during posted hours it is illegal to use your cell phone to make a call, text message or social media networking. Fines for a first offense for illegally using your cell phone in a school zone is $175 for a first offense. Second offenses carry a fine of up to $500. Approximately 1.6 million crashes every year due to cell phone use while driving. 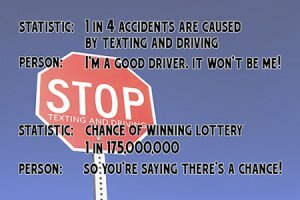 25% of car accidents are caused by texting and driving. Approximately 330,000 injuries occur each year from accidents caused by texting while driving. Texting while driving is 6x more likely to result in an accident than drunk driving. 74% of drivers support banning hand-held cell phone use while driving. A text message is more dangerous than talking on the phone. 94% of drivers support banning texting while driving. Distracted driving is at epidemic status in the United States. There are too many accidents, injuries and lives lost due to texting and driving. If you or a loved one has been injured in an accident, contact the Law Offices of L. Clayton Burgess. Our team of car accident attorneys will help you work to receive the compensation you deserve.